OTTAWA (June 24, 2014) The Ottawa International Animation Festival (OIAF) is pleased to announce the finalists for the competition of Short Films for Kids and Series for Kids at this year’s Festival running September 17-21. While last year’s OIAF winner in Series for TV, Regular Show, returns with the hilarious The Last Laserdisc Player, France dominates the category with three submissions: Les Larmes du Crocodile by Agnés Lecreux, Steven De Beul & Ben Tesseur; La Bûche de Noël by Ben Tesseur, Vincent Tavier, Stéphane Aubier and Vincent Patar (Belgium & France); Le Parfum de la carotte by Arnaud Demuynck and Rémi Durin. Also competing in the Series category, the winner of the OIAF 2009 prize for Best Student Film, Angela Steffen, presenting her new series, Das Huhn auf meiner Schmusedecke (Patchwork Chicken). The Short Films for Kids category includes films from 9 countries. Among the highlights are Yulia Aronova’s My Mom is an Airplane, Anatole’s Little Saucepan by Eric Montchaud, and Serhiy Melnichenko’s wondrous The Fish-Tailed Girl. American Anthony Dusko returns to OIAF competition with his short piece of absurd hilarity, Strawberry Girl finds a True Friend. The judges for these two categories will be local children with ages between 8 and 11. Animation enthusiasts can apply for the Kids Jury contest by submitting a one-page essay about their favourite animation film/character, a video recording or an animation film using an Ipad app. • Regular Show – The Last Laserdisc Player by JG Quintel. Kids competition this year had 160 entries for the short animation category and 75 entries for the series category. 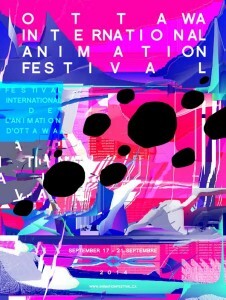 The Ottawa International Animation Festival (OIAF) is one of the world’s leading animation events providing screenings, exhibits, workshops and entertainment since 1976. OIAF is an annual five-day event bringing art and industry together in a vibrant hub, with a total attendance of 28,000 artists, producers, students and animation fans from around the world. This year’s Festival runs from September 17-21. For more information about the Ottawa International Animation Festival as well as media passes, visit www.animationfestival.ca. This entry was posted on Wednesday, June 25th, 2014 at 9:31 am	and is filed under News. You can follow any responses to this entry through the RSS 2.0 feed.